Use WhatsNext.com to take complete control of your career in a matter of minutes. Everything you need to find, create, and manage your career in a single platform. Here are five tips for getting started, drawn from the What's Next special report, Career Change & Life Balance. 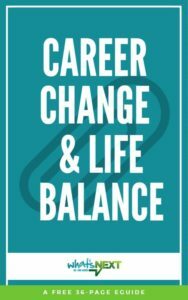 Download the entire free special report, Career Change & Life Balance, now.